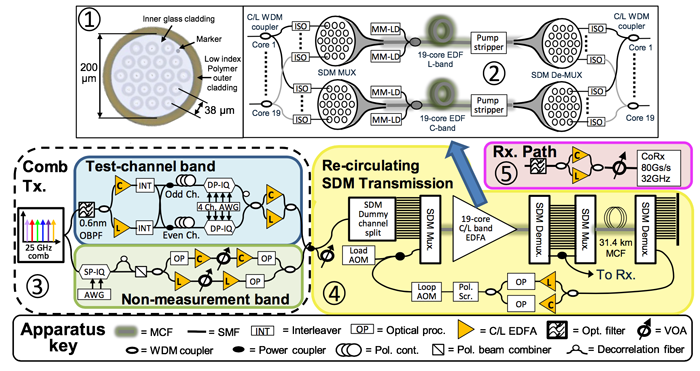 NICT and Furukawa Electric Co., Ltd. (Furukawa Electric, President: Keiichi Kobayashi) jointly report a record SDM transmission experiment using multi-core fiber amplifier. Furukawa Electric developed a 19-core Erbium-doped-fiber amplifier utilizing cladding-pumping technology in order to share electrical power between the large number of spatial channels. The amplifier was then integrated into NICT’s state of the art transmission test bed of for a record transmission demonstration. Fully decoded optical data transmission of 715 Tb/s was achieved over a distance of 2,009 km using coded polarization division multiplexed (PDM) -16 quadrature-amplitude modulation (QAM) of 345 carriers over the C and L band in a re-circulating transmission loop. The partners have performed a record data-throughput x distance experiment using an SDM amplifier. NICT constructed a recirculating transmission test-bed around the 19-core, cladding-pumped EDFA developed by Furukawa Electric. Fig. 1 shows a comparison with a selection of existing transmission demonstrations using SDM amplifiers. The amplifier, shown schematically in Fig. 2, was used to amplify signals in 19 cores simultaneously using two un-cooled multi-mode laser pumps per band. The combined pump power was 13.7 W and 43.5 W for the L-band and C-band EDFs respectively, equivalent to conversion efficiencies from electrical power of 40.3 % and 41.6 %. In the experimental system shown in Fig. 2, verification throughput and quality of the received channels was determined by 3 methods. In addition to the calculation of the bit-error-rate and Q-factor, the post-FEC performance of each spatial channel was computed by decoding corresponding received signal using LDPC codes from the DVB-S2 standard to achieve a specified BER and then assuming an additional hard-decision outer code. In addition the generalized mutual information (GMI) was calculated for each received channel and used to estimate the maximum possible throughput of each channel assuming the existence of the optimum error correcting code. Fig. 3 shows the combined data-rate for each of the 345 wavelength channels in all 19-cores after decoding together with an estimate of the theoretical maximum data throughput estimated from the GMI.